That was a pretty good ending to Series Two of 'New' Doctor Who. Army of Ghosts did a fine job of building up the mystery and in had a series of rolling revelations, culminating in the Daleks that laid the foundations for Doomsday's denouement. It doesn't escape entirely unscathed: the Ghostbusters 'moment' surely has to be one of the most cringeworthy in the series entire history; there's no real explanation as to how Cyber-Hartman escapes her conditioning to help the Doctor and Rose and nor - unless I missed it - do we get an explanation as to why Pete Tyler knows to arrive at just the right moment to collect Rose. But I'm sure all of these can be explained away. I do have one major complaint. 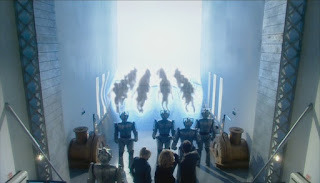 Whilst Cybermen v Daleks is one of those 'fan' things that we've all wanted to see it doesn't really work here because the Daleks find the Cybermen such a walkover. 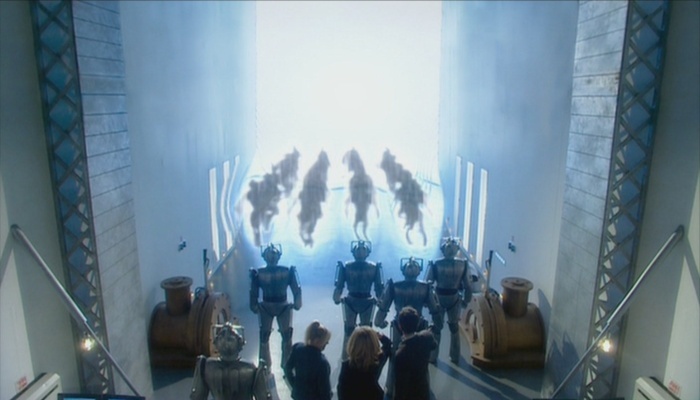 In the end they're ghosts to allow the Cybermen reveal to allow the big Dalek ending. They're a McGuffin. They're the Vardans to the Dalek's Sontarans, which is about as insulting a description as I can come up with in Doctor Who terms. However it does give the Daleks some dry dismissive dialogue when faced with Cyber threats. I particularly liked: "It is not war. It is pest control." I also liked the idea of 'The Cult of Skaro'. That the Daleks, to try and win the time war, might lower themselves to letting a small number of them think like their opponents. Perhaps they're descendants of the Doctor's 'human factor' work back in 'Evil of the Daleks'. The fact that they all have names reminds me of Alpha and Beta. Perhaps in their down town their play at being trains. Fantastically directed by Graeme Harper (who must go down as one of the great Doctor Who directors) it sweeps along at a pace that means you're grateful for the occassional moment of emotion that slows things down. We get a number of plotlines twisted together here: the Torchwood Institute is revealed in its full modern glory, headed up by Yvonne Hartman (Tracy-Ann Oberman) working loyally for Queen and Country; the alt-Universe Pete Tyler gets to meet 'our' Universe's Jackie Tyler (and I admit I did sniffle a bit at their first meeting together, especially as it was both funny and moving); we get to see Mickey & Jake again and catch-up on their battles against the Cybermen on the alt-Earth. This new Mickey is pretty cool in my humble opinion and as I've said before his story is the quieter arc throughout the first two seasons of 'New' Doctor Who. As Rose says, she's changed, but so has Mickey. Which brings me on to the key change: Rose's departure. It's all nicely sign-posted throughout (and has been for the last couple of episodes) and in the end even I, who have been coldly cynical about the way Rose and the Doctor have become so bloody couplely, cried at the end. It always had to end like this sadly because the Doctor 'settling down' with a companion isn't going to happen because it is the end of the series as we know it. Perhaps there would be a market for Mr. & Mrs Doctor Who, a series set on Earth where they've settled down and gone back to work with UNIT. It could be like Pertwee's Season 7 with added kissing. Anyway I digress. Rose gets a great ending. The Doctor doesn't quite get to say I love you (and I wonder where RTD lost the courage of his convictions on this one). Rose does. 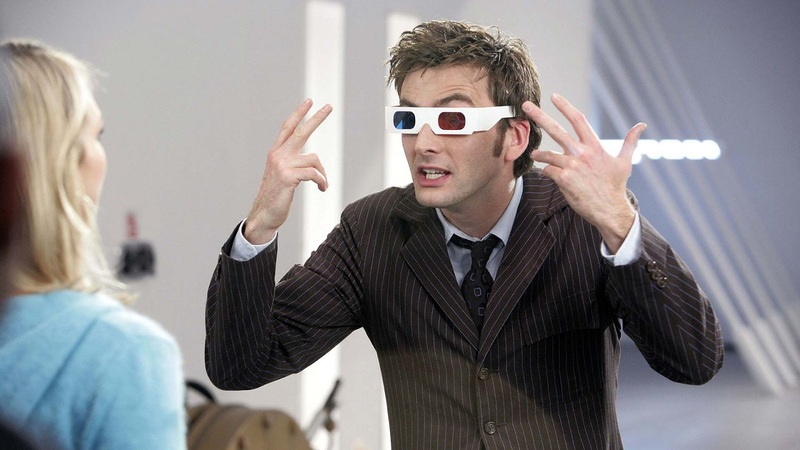 It's nicely played by both David Tennant and Billie Piper with excellent support from Camille Coduri (who is bloody brilliant throughout imo), Noel Clarke and Shaun Dingwell. All three do some lovely awkward-discomfort looks at Rose's emotions and there is the rather sweet touch of all three of them standing there hand-in-hand. So overall a fine ending to a mixed season. Next up Catherine Tate and 'The Runaway Bride'.